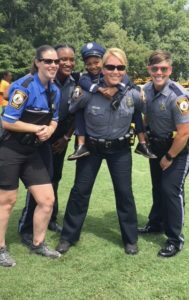 Five-year-old Amir Amin (or as he calls himself Lieutenant Amin) doesn’t know about the nationwide Police Lip Sync Challenge or that the Richmond Police Department challenged the Henrico County Police Division last week after releasing it’s own lip sync video, drawing praise from singer Sara Bareilles. Amir just knows he’s having fun. 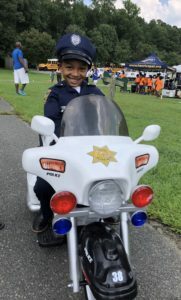 Dressed in his tiny police uniform, he throws his leg over his toy police motorcycle and proceeds to lead the pace for two motorcycle officers from Henrico Police as they drive down a small asphalt strip at Deep Run Park with cameras rolling. Amir is just one of the hundreds of volunteers that gathered at the park last week to help create a video Henrico hopes will best the competition. 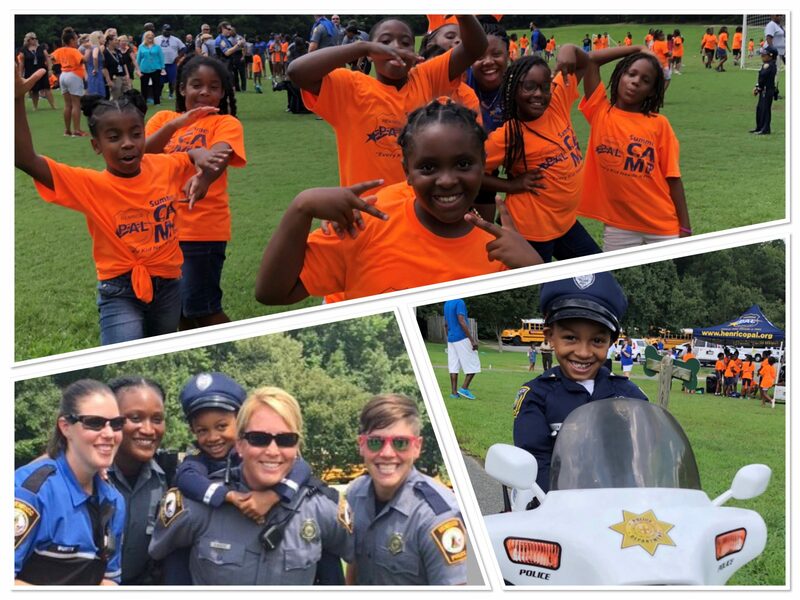 Volunteers from the Henrico Division of Fire, Lakeside, and Tuckahoe Rescue Squads, and Henrico Sheriff’s Office joined with Henrico Police and members of its communication center as well as about 300 kids from the Henrico Police Athletic League’s summer camp to dance to the music of DJ Jazzy Jeff & The Fresh Prince (Will Smith’s) Summertime. Even Gracie, one of the sweetest bloodhounds around, had the chance to ham it up with Officer Christopher Lanham of the Canine Unit. 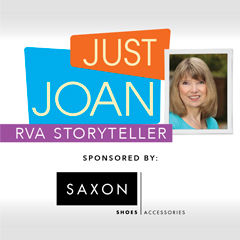 Henrico had been tossing around the idea of making a lip sync video for a while but everything went into high gear when Richmond made its challenge. Henrico Police had already taken the lead on creating a county work group that also included Henrico Security, Henrico Fire, the Sheriff’s Office, and PAL. The group was tasked with creating the concept and choosing the song for the video. The song ended up being the tricky part of the equation. “We wanted to have a fun song that people could dance to and knew and enjoyed but at the same time we wanted it be appropriate for all ages and for a public safety entity of Henrico to use,” Beck says. The group had considered a few concepts before Norfolk or Richmond Police posted their videos. “We had lots of citizens reaching out to us saying ‘I hope Henrico does this,’” Beck says. Medina readily says he’s the “character in the department.” And, he has a tie to the song. “When I was younger I said it wasn’t summer until I heard Will Smith’s Summertime on the radio,” he says. He spent about a week rehearsing the hip-hop song. “The last verse of the song is the hardest because it has lots of stops and starts,” he says. The video was purposely filmed at various locations around the county. “We wanted to showcase all of the different areas of the county and represent it as a whole and not just one area,” Beck says. That’s why Amir’s grandmother, Debrah Simmons, wanted her grandson to participate. He became interested in the police about two years ago. “He wanted to be a policeman/fireman,” says Simmons who began taking Amir to different police events. Shout out to the Richmond Police Department for their excellent lip sync challenge video. Watch here!